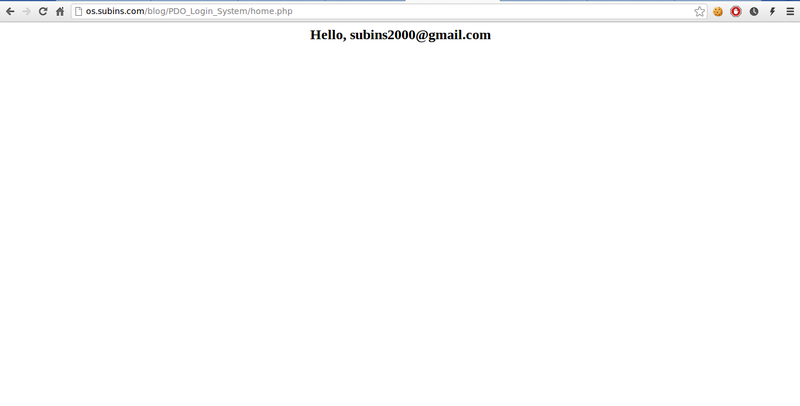 There were a lot of people who created tutorials to create a PHP Login System. But they were all vulnerable to MySQL Injection. In this post I'm going to demonstrate a login system free of this vulnerability. It is very secure. There are mysqli and PDO in PHP to escape these injections. We are going to use PDO ( PHP Data Object ). There is a new, better advanced login system which you can check out here. For storing user information you have to create a table named users. Here is the SQL code to create the table. The column username is to store the e-mail of the user. This e-mail is used as the username. The column password is to store user's password which will be heavily encrypted using SHA256. The column psalt contains a random text to check if password is true. Now we should add a user to the table. Execute the following SQL code to create a user. Now we should add the PHP code to check whether the username and password is correct. You should add the PHP code before </form> we just added in login.php. Note to change the Database credentials on above code. This login system is totally 99% secure. It's very hard to crack for a hacker and it's completely MySQL Injection free. It took me less than 1 hour to create this system and create this post. Happy Logging. If you have any problems/suggestions/feedbacks just comment. I will help you.